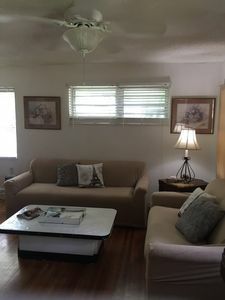 Neat and Clean Beautiful 2-Bedroom (Master & FullSize) and 1-Office House with One Master Bathroom and One Full Size Bathroom, Large Kitchen with all utensils and Covered Parking. Centrally Air-Conditioned and has a huge Back Lot with Sitting Area. Laundry Room with Washer & Dryer available. Walmart, Chick-Filla, Mcdonalds, Dominos, Subway, Panera Bread and many other restaurants in 1-mile radius. We are looking for someone to stay in our home over the summer May- Aug. Our home sleeps 6 comfortably with a baby nursery as well if needed. We would ask that you help take light care of the home and yard while we are away. Closet and drawer space would be cleared out for you to move in. We are located 1 minute from Birmingham's best shopping area, The Summit, with every shop and restaurant you can think of! There are a handful of restaurants you can walk to from our house. Like Alabama Biscuit, Miss Myras BBQ, or Crestline Bagel. Please let us know if you have any questions regarding details about renting for the full summer. 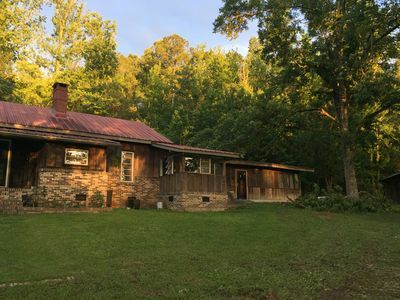 Idyllic updated farmhouse on 100 acre cattle ranch with 5 acre stocked pond. 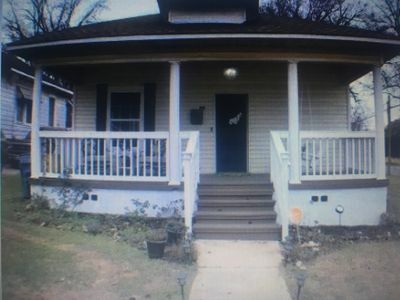 Two bedrooms (1 queen, 1 full), two baths, fully equipped kitchen with granite countertops, front porch, sunroom with additional dining area, huge enclosed screened back porch. 30 miles to Birmingham, 5 miles to Pell City, 5 miles to Lake Logan Martin, 18 miles to Talladega Speedway, 1 1/2 hours to Atlanta. 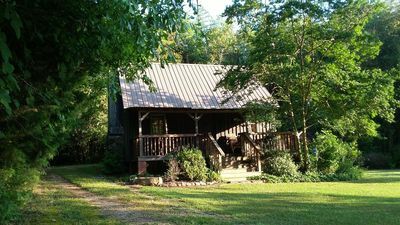 Perfect for tranquil retreat, fishing vacation, or out of the city residence while doing business in Birmingham. 5 miles to I-20. Located central to Birmingham, Mountain Brook, and Homewood portion of Birmingham. Airport 15 minutes away and from Childrens, UAB, St. Vincents and Brookwood hospitals. Minutes to Birmingham Zoo walking trails. Home has Cottage charm with Woodland view from inside and from large deck with outdoor sink and prep counter which is great for entertaining can open up 3 sets of French Drs. to deck area. 2 Bedrooms, 2 full baths, large dressing room that can be used for a sitting room or additional sleep area. Large living room plus library den with dining that is open to fully equipped kitchen, Stainless steel appliances, granite counters. There is a one car garage with opener and direct access to the library/dining room, wet bar. The deck may be accessed via a ramp from the side of the house or by steps from the walled garden as well as from the den & dining area. Hardwood floors, Tiled baths, Stack washer and dryer adjacent to 1 bedroom. Linens, cookware, utensils, everything you need to make you feel at home is in this lovely cottage and you are minutes to almost everything you might want to see, The Birmingham Zoo, Botanical Gardens, Japanese Gardens, Crestline Village, English Village and Mountain Brook Village with a walking trail off Shades Creek Parkway for nature lovers and fine dining , Shops and even Ice Cream. 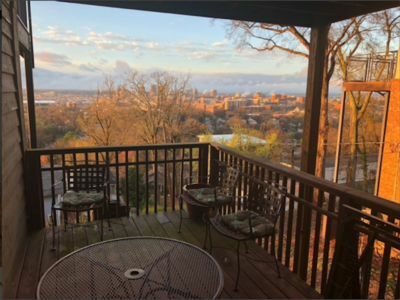 Convenient to The City of Homewood and Vulcan Park-Birmingham's Famous Iron man statue, Trails in downtown such as the Rotary Trail, and Railroad Park which is beautiful in the evening with Birmingham Skyline as your backdrop. This is perfect for 2 couples to comfortably share. 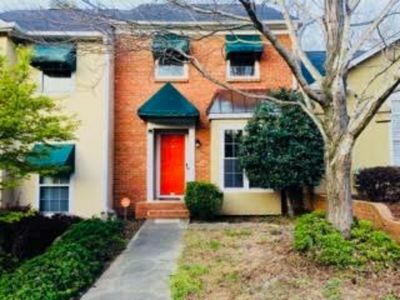 Fantastic townhouse in one of Birmingham's most desired neighborhoods. A covered front porch with French doors welcomes you to this 2 BR and 2 BA on one level. The open floor plan has 9-foot ceilings with beautiful crown molding. The kitchen with breakfast bar opens to the living room and a separate dining area. Private fenced in backyard. This community features sidewalks, streetlights and a great neighborhood pool. Conveniently located 0.3 miles from the Colonnade and 0.5 miles from the Summit with easy access to I-459, I-65, Hwy 280 and Grandview Medical Center. 10 min drive to downtown. LAKE FRONT HOME! Sleeps 12. Bonus room with bunks, ping pong and playstation. PLEASE READ THIS DESCRIPTION AND ALL OF THE REVIEWS AS THEY MAY ANSWER MOST ALL QUESTIONS YOU HAVE. ALSO, THERE IS A MAP OF MY PROPERTY ON THE LISTING THAT CAN HELP YOU REGARDING WHERE YOU WANT TO GO AND WANT TO DO DURING YOUR VISIT. 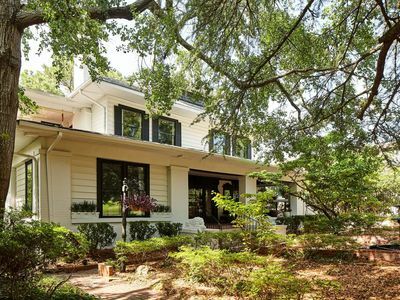 In the convenient and upscale neighborhood of Forest Park, this completely renovated dream home has every luxury. Located on a quiet, private street with two-car carport just one step into the kitchen and entire main level. Lovely, lush landscaped grounds with private walled garden, grand gourmet kitchen with Alabama White marble countertops, Wolf commercial range, Subzero Refrigerator and large pantry. Breakfast room with seating for 6 and large laundry room off of kitchen. Spacious living room with tons of natural light and gleaming ebony hardwood floors, custom Limestone wood-burning fireplace, vaulted ceilings, and dining with seating for 6. The home sleeps 9 comfortably. Master suite, two guest rooms and two full baths on the main level and an enormous master suite downstairs with private study with twin sized daybed, room sized walk in closet, large bathroom with over sized soaking tub and separate glass shower, private lavatory closet and double vanities. 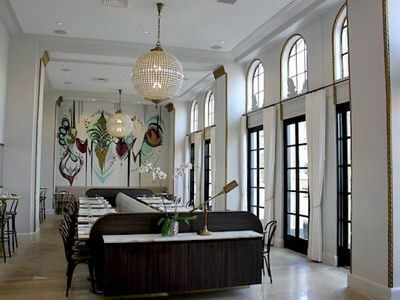 The homes’ eclectic design is derived from the use of fine antiques, classic reproductions and modern accents. 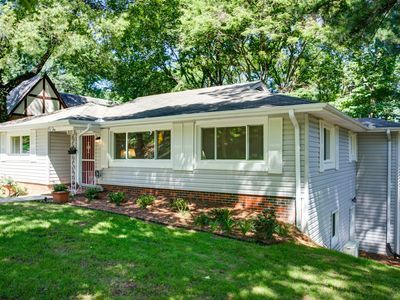 We invite you to enjoy our adorable, renovated mid-century modern house in the heart of Crestwood/Avondale. 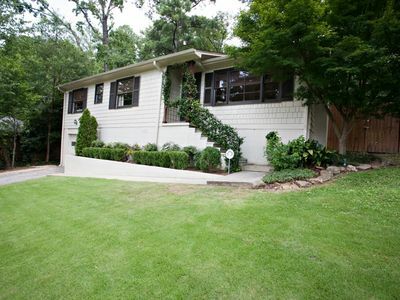 We recently restored this 1950's home. The house is now fully updated, with a new kitchen, bath, and hardwood floors throughout. Enjoy the screened-in porch, private back deck, and large fenced in back yard. This house can comfortably accommodate up to 6 guests. Each of the two bedrooms has a queen memory foam mattress, and there is a new sleeper sofa in the living room. We hope you will find the space inviting, well-stocked, and cozy. 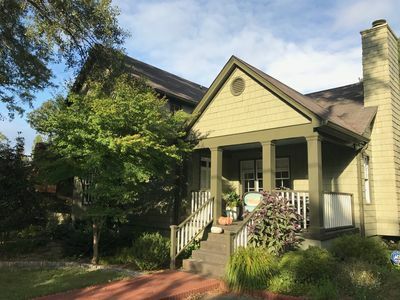 Located between Avondale and Crestwood, this house is very convenient -- walk to Cahaba Brewing Company; bike to Avondale's restaurants, bars, and park; or get downtown by car in just a few minutes. It is a great house for families, solo adventurers, business travelers, and small groups. We hope you enjoy your stay! This is a jewel of a home located in the hip part of town, Avondale! 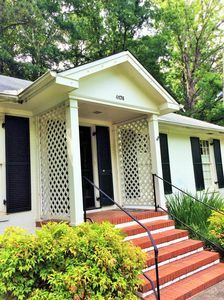 2BR 2 BA, 1 block walking distance to Cahaba Brewery and 4 blocks from Avondale Park and all the cool restaurants. It is 1700 sq ft, all updated, with a huge screened in sitting porch. The neighborhood is south of 5th in a safe and well established area that is climbing in value quickly. The beds are high-end saatva and the kitchen is well stocked. The backyard is huge, fenced, with an outdoor covered patio. Gorgeous hardwood floors, new lighting throughout, stainless appliances, brand new hvac, internet, exterior security, washer/dryer and dishwasher. The decor has a designer's touch. Note: Parking is on the street. No grill as of yet. Dogs MUST be pre-approved by owner. TV is Roku and includes Netflix and Spectrum Streaming App. There is a queen floor foam mattress also. Waterfront Lake Home that is great for a large family or group. 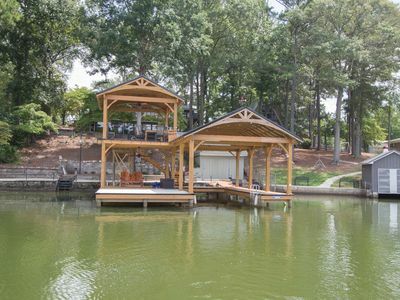 This is a 7 bedroom home on Logan Martin Lake, with an Awesome two-story dock. There is a glider swing under a shaded area of the dock, then a large, open section of dock to lay out in the sun. The upper part of the dock has a place to eat and sit and gaze at the sunset, with a gate that opens out for a high dive. Award-winning bass fishing right off the private dock, and cleats on the side of the pier to tie your boat if you bring it along. (We do have our own boat that stays in the boat slip, and cannot be moved). 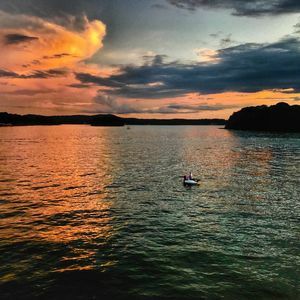 This lake haven is perfect for a family, a large group, or a business retreat. Come enjoy beautiful Fall and Winter sunsets, as well as Spring and Summer lake wildlife. Our lake home is 70% updated and remodeled. The upstairs portion of the house is older, and we like it that way! 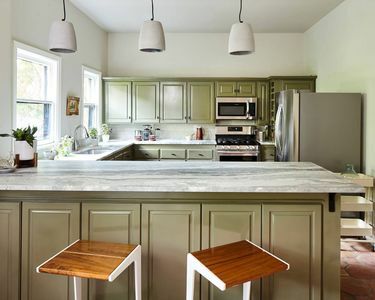 The kitchen has original wood cabinets and a small island. We have updated kitchen countertops to granite and new tile back splash. There are many spices and oils in the cabinets as well as coffee, tea, and honey. There are also some condiments in the fridge as well. There are many pots, pans, bowls and casserole dishes to cook with. There is a stove, a new fridge, a dishwasher, microwave, blender, toaster, and coffee maker. There is also a second older fridge out in the enclosed porch area for overflow use. This home also has a huge, partially enclosed porch 30x50 with an awesome lake view. A small child's play/swing set is on the porch as well as a table, chairs, rocking chair, and a ping-pong table. There are some small toddler type beds downstairs for younger children as well as a pack-n-play that is available. A total of 4 king beds, 2 queen beds, 1 double bed, 1Twin bed, a set of toddler-size bunk beds, and 2 fold down couches. 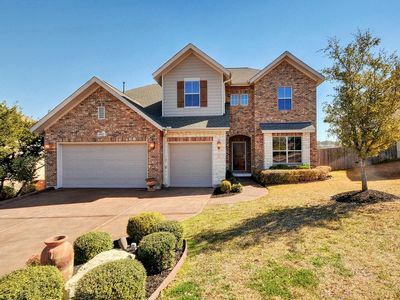 There are 3 bedrooms/2 baths on the upstairs Main floor level, and 4 bedrooms/4.5 baths on the lower level. The walk down to the upper pier is mostly a low slope walkway with no steps. There is no back yard grassy area to play in. ) My wife has a bad knee, and I built this lake house with her in mind to give her better access to the lake safely. There are approximately 8 "spaces" for parking in the front yard and one covered space in the carport. The front yard is mostly gravel with some landscaped areas. There is a 2-sided grill. It is a propane gas/charcoal grill outside the kitchen door for your use. Also in the bottom of the boat house is an outdoor fire grill that u can use wood or charcoal in. We have 2 canoes in bottom of boat house for your use. Please wear life jackets. There is Apple TV for your use to connect with. The router is plugged in on the kitchen counter. The wifi code is on the router. Here are more details on bedrooms and type of showers: There are 3 bedrooms UPSTAIRS. Room 1 has a King bed in the Master room Upstairs. It has a small, private bath with a tub/shower combo. There are also 2 more bedrooms Upstairs, (Rooms 2 and 3) one with a Full Size Bed, and one with a King bed. These 2 bedrooms share a hall bath, that has a tub/shower combo. There are 4 bedrooms DOWNSTAIRS. Room 4 has a King bed, and a private bath with a tub/shower combo. This room also has a small area that has 2 kid-sized beds and a pac n play in it. There is a pull curtain between these 2 areas of the room. Room 5 is the coldest room in the house! It has a Queen bed and a private bath with a tub/shower combo. Room 6 is the end room and has a Queen bed. It also has a private bath with the largest step-in shower that has two heads and a shower seat. This is also the bathroom that has a door to the outside. Room 7 has a King bed and is the warmest room in the house. It has lots of windows, with blinds, and a view of the lake. It also has a small room portable AC unit. It has a private bath and a step- in shower with a moveable seat. 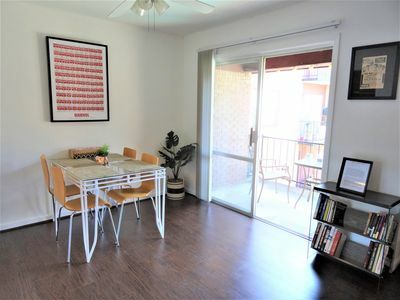 There is a kitchen table in the eat in area of the kitchen upstairs, and a large den area upstairs with an adjoining area that has a long slender table to eat on. 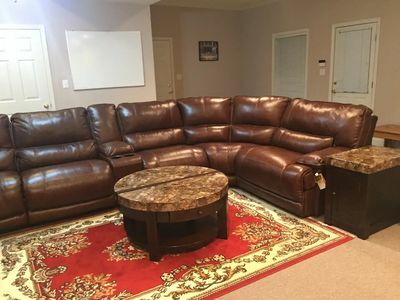 There is a common den area downstairs, with a couple of couches, for gathering to relax and visit. NOTE: There is a detached private room that is on the top of the boathouse, near the pier. It is possible that we, the owners, may be there staying in that room during your stay at the lake house. We will notify you via text if that is the case. 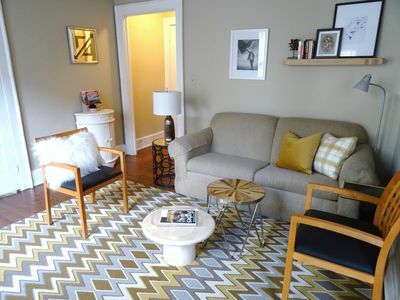 Beautiful one-bedroom condo in a Birmingham historic district. 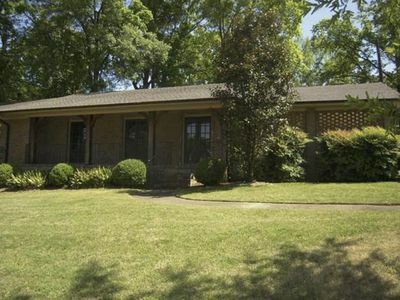 Close to downtown, Mountain Brook, Five Points and Highland Avenue. Condo features a Queen Bed in the bedroom with cotton bedding, and a Queen Sleeper Sofa, eat-in kitchen, full-size refrigerator, dishwasher, washer and dryer, gas range, tiled bathroom, hardwood floors, free wireless internet, off-street parking, and two televisions with ATT U-Verse cable, Roku and DVD player. Beautiful, large lakefront home with beautiful views and just steps away from the Alpine Bay Golf Club. Nice shaded lot with 300 ft of shoreline. 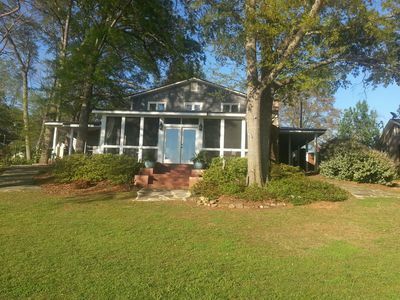 This home is great for a large family or multiple families that want to vacation in a beautiful location in close proximity to the Talledega Speedway. 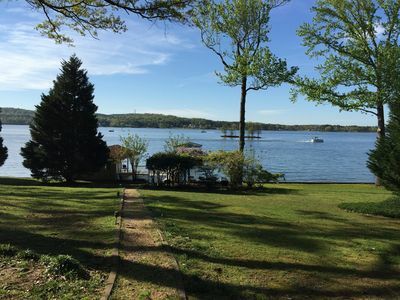 This home has one of the only year round natural beaches for easing into the beautiful lake water. Master suite on the main floor with a picture window to wake up to beautiful lake views from bed. 4 bedrooms and a bunk room, 4 bathrooms, a huge great room with vaulted ceilings, large deck, boathouse, long dock and much more!! No pets, smoking or alcohol allowed. You will love this recently renovated, comfortable farmhouse modern two bedroom/one bath apartment with a private balcony. From the spacious eat-in kitchen to the built-in queen-size bunk beds, the apartment has plenty of room for your group to rest and relax. The apartment is part of a larger historic home with five separate apartments, each with their own private, exterior entrance. The entire home was built in the 1890s and renovated in 2018. The apartments share access to the property's outdoor lounge, dining, and entertainment areas. Welcome to Eden Brae, a renovated Southern Gothic mansion, which was featured in Birmingham Magazine as one of the coolest rentals in Birmingham. Fantastic for large groups and special events, the house offers unique 'separate, togetherness' with 5 separate apartments and several common gathering spaces, both indoor and out. 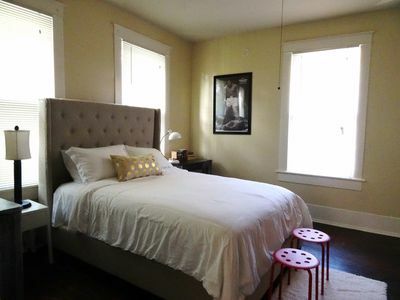 Built in 1910 and renovated in 2018, the house combines historic charm with modern style and can sleep over 22 in beds. The house offers three 2 bedroom/1 bath apartments and two 1 bedroom/1 bath -- each with its own private, exterior entrance. You'll love this fun, bright, and open apartment. 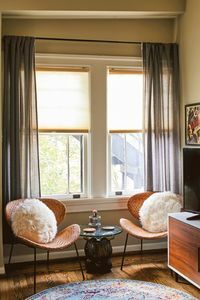 Just renovated, this unit celebrates the best of the 1970s - macrame, earth tones, hammock chairs. It's playful, modern, and incredibly comfortable. Located on a beautiful gated property in one of the most desirable and walkable neighborhoods in town, it is just steps from public golf and tennis, restaurants, coffee, and parks. More pictures to follow, but to get see our style check out our other listing. The apartment is located in a historic home, which has been divided into 5 separate apartments, each with their own private, exterior access. All of the units are fully updated. Guests will have shared access to the gated grounds of the property. We are in the process of updating the exterior of the house and will have outdoor dining and lounge areas. Featured in Birmingham Magazine as one of the coolest vacation rentals in Birmingham, this 2 bedroom, 1 bath spacious and luxurious apartment is the gem of Eden Brae, a renovated Southern gothic mansion nestled between Highland Park and Forest Park. Each apartment in Eden Brae has its own private, exterior entrance, and they are available to rent individually or all 5 apartments are available for a whole house rental. Made for entertaining, this apartment is approximately 1,400 square feet and features a stunning chef's kitchen and a dining room for 14. If you'd rather entertain outside, it shares access to the property's outdoor kitchen and screened outdoor dining room. Your group will love the apartment's spacious living room. Gather around and enjoy a cocktail or snuggle up and watch a movie on our Netflix and Hulu enabled RokuTV. If you are staying with us for business, an HDMI cord is available to display presentations on the TV. 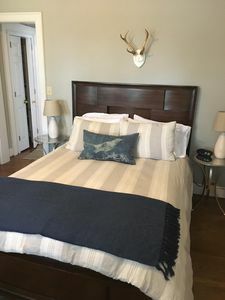 The apartment has two bedrooms, both featuring memory foam mattresses and comfortable sheets that our guests have loved. The master bedroom has a luxurious king sized bed, and the guest bedroom has two full sized beds. Eden Brae is just blocks from great attractions. If you would like to play golf or tennis during your stay, Highland Park Golf and Tennis Club is literally around the corner. This public park is one of the most popular courses in town, and it's incredibly easy to arrange a tee time or driving range slot in person or online. If you are traveling with kids, head over to Rushton Park. Just a couple of blocks away, Rushton Park has a lovely playground and basketball park. If you'd like to grab a bite to eat or a cup of coffee, Rojo (a popular neighborhood Mexican restaurant that feature live music in the evenings) and O'Henry's Coffee are next door. This modern, sun-filled 1 bed/1 bath apartment in a renovated Southern gothic mansion will be your home away from home. Featured in Birmingham Magazine, this comfortable, stylish apartment with a private terrace has plenty of amenities, indoor and out. The mansion is on one of the most desirable and walkable neighborhoods in the city of Birmingham. This apartment is one of five in the mansion, each with its own private, exterior entrance. For all those that want to enjoy privacy on your visit away from home. Perfect for out of town business, family get a ways,Graduations,or to just visit the magic city. Perfect for golfers and associates, those on extended visits, wedding groups, and events. Convenient to interstates 65, 20/59,459, highway 280 and 31. Brookwood & st. Vincents hospitals: 10-15 minutes UAB and Samford just a short drive away. Brand New and Gorgeous! 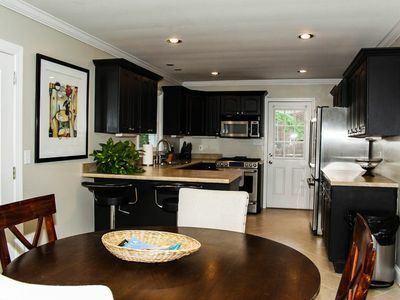 Upscale Birmingham Townhome in a Fantastic Location! Brand new, upscale and gorgeous townhome! High ceilings, beautiful moldings, hardwood floors, gorgeous kitchen with gas, marble counters and stainless appliances. Private, gated rear parking with front and back porch. Sidewalks and onstreet front parking as well. Powder room bath on main floor. Upstairs find two gorgeous bedrooms, with the latest in finishes and fixtures. Walk to restaurants, Five Points South and even to dinner at the award winning Highlands or Chez Fon Fon! 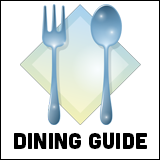 Breakfast at the Pancake House or check out Golden Temple or Mellow Mushroom on foot! 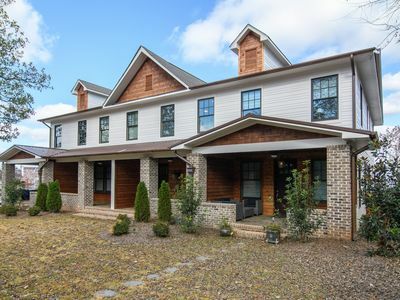 By car, minutes to Mountain Brook's English Village and Homewood. Business meeting Downtown?.... five minutes away. While in our city, stay here, where residential meets urban and enjoy all of the beauty and fun Birmingham has to offer. Looking for convenience and comfort? This modern, 1bd1bth, newly renovated condo is it. One of the only gated condo communities in Southside--the heart of downtown Birmingham. A courtyard-style community that overlooks the pool and grilling area, clubhouse for entertaining, and a great on-site laundry facility. King bed w. walk-in closet, parking, etc. The best part: only 3 short blocks to UAB, one short block walk to the famous Dream Land BBQ, Zyp Bike, convenient store. A 10-15 min. walking distance to great restaurants, shopping and nightlife in Five Points South. Late arrivals are no problem. FREE early check in (must contact host for availability.) Guests have access to the entire condo, pool, bbq grills, fire pits and laundry room in the building. FREE off street parking and lots free street parking. FREE wifi with premium speeds. Free smart TV. 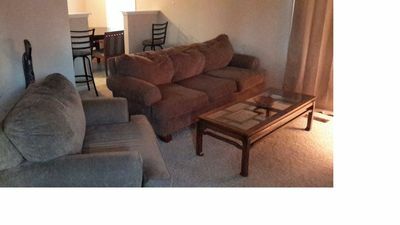 This is a very nice, clean, and fully equipped-furnished condo. A chance for at-home feel for the price of a hotel. Hotel like treatment: -Large bedroom holds KING sized bed that comfortably sleeps 2 adults, Clean and comfortable bed sheets, pillows, duvets. All mattresses covered with high quality mattress pads. - Three size towels, 3 in 1 shampoo/body wash soap, hair dryer, etc provided. Desk and comfortable chair to read and write. Lots closet spaces in the hall and living room, large walking closet space in the bedroom with chest of drawers, bath robes and hangers. The convertible sofa transitions between a sofa and a full-sized sleeper with ease. - 43" Smart TV that allow connection to Youtube, Netflix, Hulu, Slings, CBS, Vimeo, social media sites and etc. for thousands of movies and entertaining programs. - Central AC/heating - Free premium speed wifi - Dining area - Fully equipped kitchen with a refrigerator, rang stove & fan hood, dish washer, microwave, toaster, kettle, hand blender, one cup K cup coffee maker, 4 cups drip coffee maker, cookware, pots&pans, dinnerware & utensils, sugar and cream, napkins, paper towels, trash bags, etc. - Private bathroom with large tub/shower. Hair dryer provided - Large walk-in closet attached to the bedroom and many storage closet space provided - Covered balcony over look the pool with large glass sliding door access from dinning room. Great place to enjoy your morning coffee and watch the evening sunset. -Pool and laundry facility are free to all our guests. -Off street parking lot are free to all our guests. This is rare to find in the city. Beautiful, affordable home in a great location. Spacious, clean and comfortable. 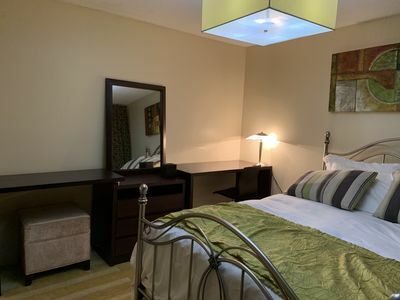 Located 10 minutes from the Birmingham International Airport and 10 minutes from the City of Birmingham and most places in Birmingham in General. Nice Kitchen, Huge fenced back yard. Free NetFlix and free Wi-Fi. Easily sleeps 6 people and gives every amenity needed for a comfortable stay for business or pleasure. I look forward to hosting you. Towels, soap, toilet paper, bedding, shampoo, conditioner, pots, pans, plates, bowls, silverware all included. Cozy house for picnic and rest. Cozy house for picnic and rest. Spend a weekend with your family out of town. Fresh air, beer and steaks are waiting for you. Three bedrooms, living room with fireplace and rocking chair. Two floors and fresh air - this is what you need. Any day you can book accommodation. Not at all expensive. Everything is ready for your comfortable stay there. Quiet neighbors, beautiful city, lots of rest. Waiting for you. 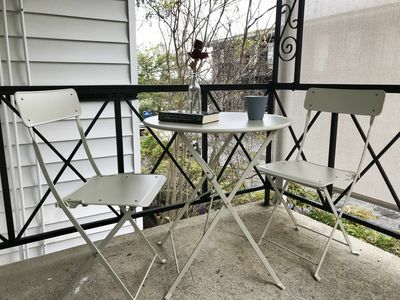 This gorgeous 1BR1BTH puts you in the HEART of all Birmingham has to offer! You do NOT need a car. Restaurants are around the corner of our Apt. 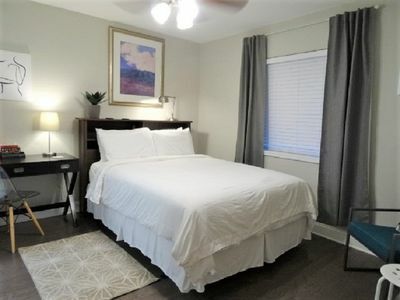 building, 5 min walk to Five Pionts South for all the award-winning restaurants, shopping, night life, Zype a bike, etc., 5-10 min or less walk to UAB hospitals & clinics, research buildings, students residents and academic area, concert and shows, etc.. Everything is CLEAN, NEW and BEAUTIFUL!!! NO CLEANING FEE! Guests have access to the entire apt. Late arrivals are no problem. FREE early check in (must contact host for availability). FREE washer and dryer in the kitchen. FREE street parking. FREE wifi with premium speeds. Free smart TV. Lots space for out of town executives, UAB related business travelers or students, families for extended visits, wedding groups, Robert Trent Jones Golf groups, and events. 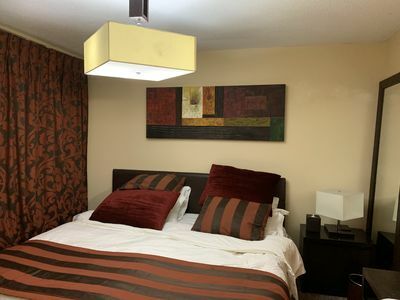 Newly and fully renovated, a great high 10 ft.+ ceiling large one bedroom, living room has full size pull out sofa bed, bedroom has queen size bed with private full bathroom attached with large walk in dressing room that has lots spacious space for storage and sitting. French door entrance and additional closet in the bedroom. Cleaning hardwood floors throughout. Large fully equipped kitchen with updated appliances. Ceiling fans are in every room. Updated ceramic tile baths. Lots storage space in the walk in entry room. Bed and bath linens provided, flat screen TV, wifi, etc.This is a very nice, clean, and fully equipped-furnished large one bedroom apt. A chance for at-home feel for the price of a five stars hotel. Hotel like treatment: - Brand new beautiful and comfortable bed sheets, pillows, duvets. All mattresses covered with high quality mattress pads. - Three size towels, body wash, hair dryer, etc provided. - Fully equipped kitchen with a refrigerator, microwave, toaster, kettle, 4 cups drip coffee maker, cookware, pepper and salt, sugar and cream, napkins, paper towels, trash bags, etc. 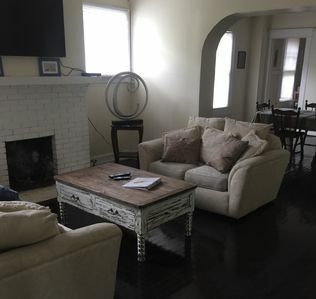 - Living room equipped with a brand new Smart flat screen TV that allow connection to Youtube, Netflix, Hulu, Slings, CBS, Vimeo, social media sites and etc. for thousands of movies and entertaining programs. - Wifi with premium speed connected, central heat and window AC for entire apt. Yurt On Beautiful Logan Martin Lake. Located within Clear Creek Cove RV Resort. 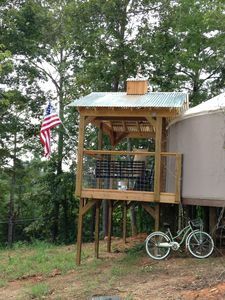 This neat Yurt is 15 minutes south of interstate I-20 & Talladega Speedway between Birmingham AL and Atlanta, GA. Located on beautiful Logan Martin Lake which is known for fishing and boating. Must be 25 to rent this property. No parties, loud music or lewd behavior. Respect the RV community. The Pacific Yurt sleeps 8 if someone sleeps on the couch. It has a private bedroom with two twin beds or place together for 1 king, a loft with 1 full mattress, 1 queen mattress and 1 long twin mattress. Heating and air. The kitchen has granite counter tops, stove, refrigerator, regular coffee maker & microwave. Charcoal grill on the deck. Bathroom has a stand up shower w/15 gallon hot water heater. We provide clean towels and linens for the beds. Deck is over looking the lake. No animals allowed or inside the yurt. The yurt is made of Vinyl and one swipe of a paw can do a lot of damage. No smoking inside of the yurt. Check-in time is 3 PM and check out time is 11 AM. If you have a problem with these times just let us know but the yurt is very popular and demand is high and we need time to clean and wash all linens. 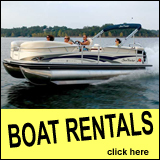 Rent a boat at one of the marinas on the lake. The park has community boat docks, boat ramp and white sandy beach. This is a rural area so pack accordingly. Outside fire pit. This property is not available to rent past 13 consecutive days. We do not rent it out for months or years at a time. THANKS! 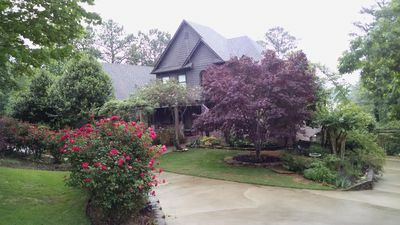 New VRBO/HomeAway listing to the Bham market! 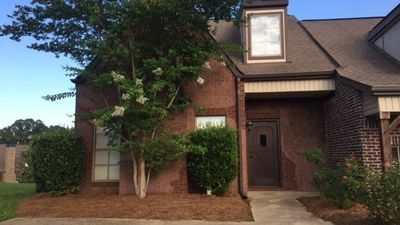 3 Bedrooms and 2.5 bathrooms with convenient parking, privacy, central to shopping (Galleria and Summit), Colleges (UAB, Samford, BSC) and RTJ Golfing! Only 10 minutes from the Hoover Metropolitan Stadium, home of the SEC Baseball Tournament 1st floor King Bed in Master with large closet and master bathroom. 1st floor also has a large kitchen with plenty of seating for 8-10 guests. Second BR upstairs has Queen bed and Third bedroom has 3 beds; Queen, full, and twin bed. Upstairs bathroom is a full BR with shower/tub. Close to most Bham wedding venues. This town home is located at the end of a cul-de-sac in a quiet professional community. Has cable TV and internet. 2 New flat screen TVs. Easy access to interstate 65 and 459. Downtown is a 15-20 minute drive to UAB and Children's Hospital. 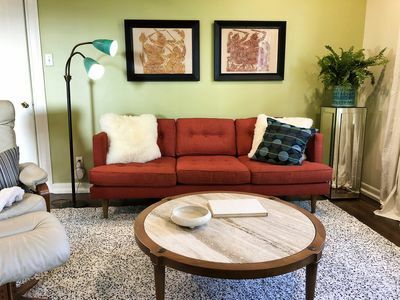 Location, Location- 2-5 minutes walk to restaurants, Zyp Bike, UAB hospitals & clinics, research buildings, students residents and academic areas, concerts and shows, and more. 10-15 mins walk to Five Pionts South for Birmingham best shopping, award-winning restaurants, entertaining and night life. Vulcan Parks, Museums, Zoo, Botanical Gardens, golf and many popular area attractions are only 5 mins Uber ride. You are in the heart of city Birmingham, you do NOT NEED a car! This newly renovated apt. 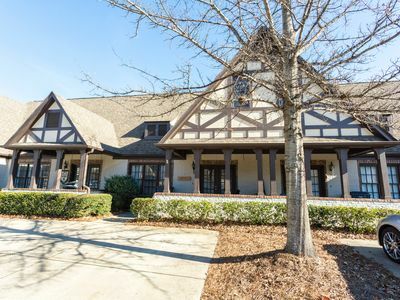 has lots space for out of town executives, UAB related business travelers or students, families for extended visits, wedding couples, Robert Trent Jones Golf groups, and events. A CHANCE FOR AN AT-HOME FEEL FOR THE PRICE OF A HOTEL. Everything is NEW and CLEAN! It features hardwood floors throughout with central heating and air. Queen bedroom with one full bathroom, walking in spacious closet in bedroom, a study for working and reading. SMART TV, CABLE, WIFI, ETC. PROVIDED. Family room has QUEEN SIZE PULL OUT MATTRESS SLEEPER SOFA(this is high quality pull out mattress), FULLY-EQUIPPED KITCHEN with refrigerator, stove, microwave, dinning room with 3 sitting chairs. Hotel-like treatment: - Clean, soft and comfortable bed sheets, pillows, duvets, blankets. All mattresses covered with high quality mattress pads. - 3 sizes of towels and hair dryer, iron and iron board. - Fully-equipped kitchen: refrigerator, range stove, microwave, toaster, kettle, 12 cup drip coffee maker, paper towels, trash bags, etc. - Living room equipped with brand new Smart TV with premium cable channels. - Premium fast Wifi and central air and heat for entire apt. Guests have access to the entire apt. Late arrivals are no problem. , FREE off street parking. FREE wifi. Gorgeous view in Clear Creek. Perfect spot for a fisherman's weekend or a very homey vacation getaway. Just 15 minutes away from Talledega race track. Home has 2 great rooms with fireplace in each. Large deck with gas grill. Nice brick patio on ground level. Lake view from almost every room. Two full baths and 2 half baths. Great yard with gentle walk down to dock. Lots of room to bring your boat. Home is fully equipped with everything you should need for a wonderful relaxing time. Beautiful private suite with private entrance in the Southside of Birmingham, AL. 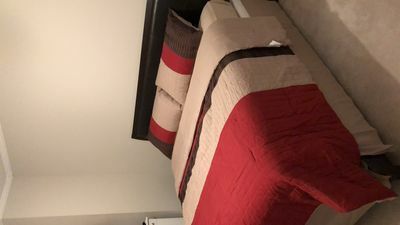 Safe Neighborhood 2 bedrooms each with king beds, one pullout couch, one twin in a living room area, one full bath, free washer and dryer, outside covered deck with BIG City View! One dedicated parking spot with extra street parking, 2 living room areas, one has a 50" TV, with a pull out couch and an extra twin bed, the other has a TV and couch. Wake up to a beautiful view over looking the city or sit on your own private patio. TV in master bedroom room. Located in south side this suite is close to everything Birmingham has to offer. Southside, downtown, Avondale, Homewood, & Lakeview. 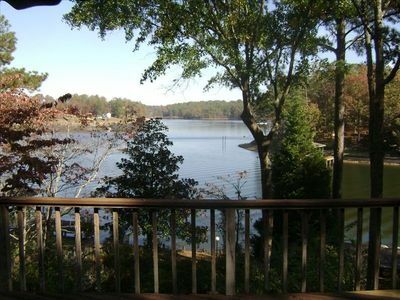 This fabulous home on a fishing lake is ideal for a 6 month to one year rental for a family traveling due to business. The home is unfurnished. 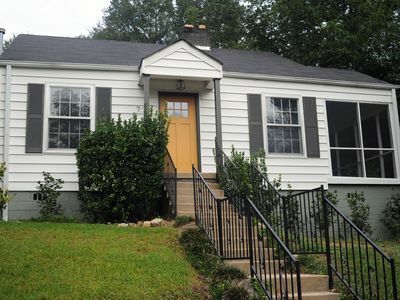 It is located in one of the most desired neighborhoods on the outskirts Birmingham Alabama. Only 5 minutes from hwy 59/20, it is ideal for any commute. The Trussville school system is highly rated and also only a short distance from home. The home boasts 3 beautiful stories with a fully finished basement for entertainment. As well as a HUGE back patio. It is on a 1 acre lot on the lake. For the outdoors person, the gardens include roses, Japanese maples, Crepe Myrtles and Tea olives. Fruit such as pairs, grapes and kiwis grow here. Also, there are plenty of hiking trails that are available. Wild life is abundant- Deer, rabbits, Ducks , Geese, Crane, Ospree, Eagles and tons of hummingbirds. In the late spring, turtles come up from the lake to lay their eggs in the BACKYARD. And the geese wander around the neighborhood with their goslings. It really is quite beautiful. 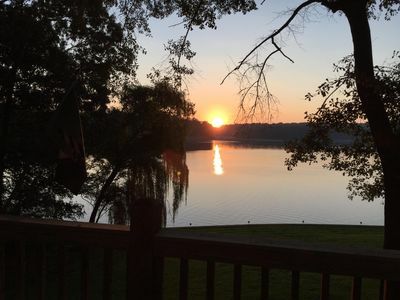 However, my favorite thing about this home, are the morning sunrises over the lake. Absolutely Breath taking! Now for the details.. Main level parking garage. Also additional garage in basement.Hard wood floors throughout main living area. Walk in closets for all bedrooms except basement bedroom. Double oven. Refrigerator and deep freezer. Laundry room with washer and dryer. Folding room. 2 linen closets. One set of sheets provided for each bed. Towels provided. It is a great place for adults and kids alike. Beautiful 2 bedroom townhouse close to everything you need-Freeways, movie theaters, restaurants, grocery stores etc!! Perfect for families and those traveling for work! Only 1.5 miles away from Galleria Mall! Within 20 min of metropolitan area! Newly remodeled, with beautiful furniture to make your stay a comfortable one! Nearby hospitals only a 10 min drive! Only 10 min from DT Birmingham. 20 min to Birmingham Airport. BEST OF BEST LOCATION! 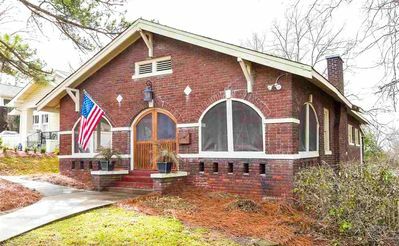 LARGE HOME SOUTHSIDE-a vibrant neighborhood in the heart of Birmingham! Historic District Home in the quite street, less than five min. to Downtown, UAB, 5 points South, Hospitals, and Dreamland BBQ. Shopping, dinning and entertainments are in 10-15 mins walkable distance. 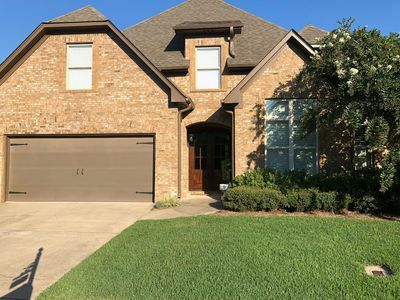 Gorgeous 5 BR and 2 full baths, formal DR, formal LR and formal FR with beautiful high ceiling(10ft+) and fire places, French door balcony, etc. Ideal for a large family and big groups! Entire house except the basement(that is our storage area) will be yours. Late arrivals are no problem. 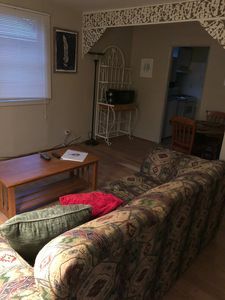 **FREE early check in (must contact host for availability), FREE washer and dryer at kitchen. Lots FREE off street parking. FREE wifi with premium speeds. Free cable smart TV. ** Lots space for out of town executives, families for extended visits, wedding groups, Robert Trent Jones Golf groups, and events. This is three stories house, guests have the access to the 1st and 2nd story(3rd story is unfinished basement that we used as storage, not for guests). A European styled vintage house, authentically from the 50's that has been renovated to have both a mix of today's modern life with a vintage layout and charms. 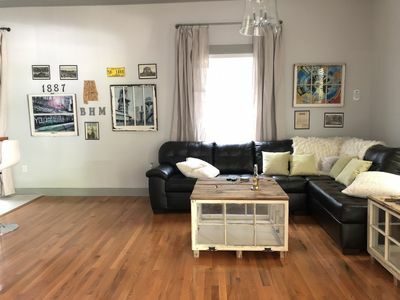 Fully renovated, a great high 10 ft.+ ceiling five bedrooms, two full bathroom historical house with large front covered porch furnished with swing chair, dining table with chairs, and lots outdoor sitting area.French door balcony and two closets with sun roof in the master bed room. Large fully equipped kitchen with updated appliances. Ceiling fans are in every room. Updated ceramic tile baths. Two bedrooms have King beds and three bedrooms have Queen beds, lots spacious closet space in each bedroom. 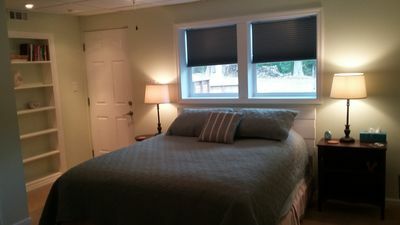 Bed and bath linens provided, Smart TV, cable, wifi, etc.This is a very nice, clean, and fully equipped-furnished large house. A chance for at-home feel for the price of a hotel. Hotel like treatment: - Brand new beautiful and comfortable bed sheets, pillows, duvets. All mattresses covered with high quality mattress pads. Each bedroom has blanket in the closet. - Three size towels, Everybody Soap for Everyone 3 in 1 soap, hair dryer, etc provided. - Fully equipped kitchen with a refrigerator, a dish washer, microwave, toaster, kettle, blender,12 cups coffee maker, Keurig one cup Coffee Maker, cookware, pepper and salt, cooking oil, sugar and cream, napkins, paper towels, trash bags, etc. - Living room equipped with Smart TV with basic cable. - Wifi with premium speed connected, central air and heat for entire house. 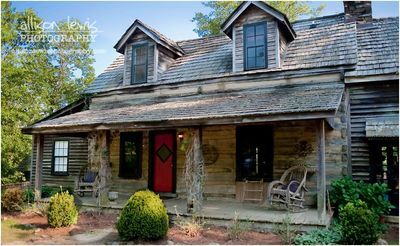 This quaint,1100 square foot house has been newly renovated! New stainless steel appliances, crown molding, and 9ft tongue and groove ceilings. 1 bedroom available with a king size bed. 2 Folding guest queen beds. Open, L-shape floor plan. Great for family or couples. House also features a fenced yard on a corner lot with a fire pit. Wi-Fi & Keyless entry/security system. Located in the quiet suburb of Tarrant. Just 6 miles from Downtown Birmingham. Parties are not permitted on the property. Whether you are coming to Birmingham as an explorer, historian, student, or for work, Thomas Jefferson Tower apartments provide the perfect space to prepare and recuperate. The professionally decorated space is designed to meet all of your needs. The kitchen is stocked with all the basics, and features European gloss cabinets, stainless appliances, quart countertops, and an island. Whether you've whipped something up in the kitchen, ordered from on of the local hot spots, or just grabbed an evening cup of tea, enjoy it at the intimate seated dining area while enjoying the downtown views. Those same views offer inspiration; inviting you on new adventures. When you stay in to work or relax, the seating area welcomes you with a variety of plush seating options. At the end of each day, you'll rest easy in your cozy bedroom that offers ample storage. Additionally, we have an onsite pet spa so if you're co-traveler is your furry friend then we have a spa for them to enjoy! - To ensure the best stay experience we run a simple background check prior to accepting a booking. A short-term renters insurance policy is also created for all guests. There are no additional fees for the background check or insurance policy. - By booking a reservation, you acknowledge you have read our rental agreement and agree to be bound by its terms. - Charges on your credit card will be billed by ApartmentJet. Your security deposit will be returned approximately 14 days after your departure date, barring any damage claims by the property owner. 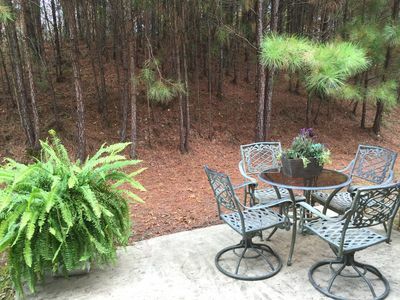 Private, simple, clean basement with covered private parking garage in Vestavia. Convenient access to HWY 31 /I-65 -WiFi -Large TV and recliner -Fridge (w. complimentary water and soda) -Coffee/Tea -Private access in quiet neighborhood -One Queen bed -Private bathroom Place is close to family-friendly activities, the city center, and nightlife. My place is good for couples, solo adventurers, and business travelers. Our older cozy home is nestled in a safe working class neighborhood. It has a wood-burning fireplace, natural hardwood floors, gated backyard for family pets to enjoy, and a deck, equipped with a charcoal grill. It is conveniently located near UAB, Princeton Baptist Medical Center, and St. Vincent's hospital; and popular shopping areas, such as The Summit and Galleria. Medical students book it! If you are looking for economy lodging in a working class neighborhood, this home is ideal for you. The house is conveniently It is compact in size, but is equipped with all your needs! The bunk beds are twin (upper) and full size (lower). Plus, there is an additional twin bed. It comes with cable and wireless internet services. The backyard is gated and is ready for your family fur babies! Conveniently located near UAB, hospitals, shopping and the expressway. Older spacious 3 Bedroom 2.5 Bath home blocks from walking trail in historic West End neighborhood and Princeton Hospital. Fenced yard and large Sun room,central heat and air, hardwood flooring throughout, laundry room equipped with washer and dryer,separate living room with fireplace and dining room. This home is fully furnished to accommodate 8-10 individuals comfortably with queen,full and twin size beds, fully equipped kitchen. The epitome of southern charm. Whether you are inside enjoying the comforts of this 3 bed/3 bath house or out on the property using the double decker pier or loading your boat into the lake via the private boat launch, you will not want to leave. Located in a very quiet area of lake Logan Martin, this slew has great fishing and awesome water for water sports. Town is just a few miles away. 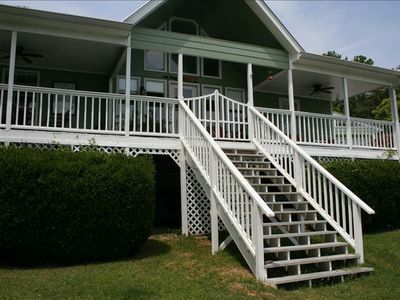 Talladega very close - 9 miles Enjoy the entire property including the private double decker pier. Easily launch your boat using our private boat launch on the property. Dock your boat or water toys on the pier during your stay. Have a BBQ with family and friends on the outdoor covered patio overlooking the lake. Charcoal BBQ grill, table and chairs are provided. Giant grassy lawn from the house to the lake perfect for corn hole, a slip & slide or other games you bring. The 3,400 sq ft house is perfect for large families or groups. Upstairs you will find the master suite with a queen bed. A large master bath is attached with double sinks, water closet, separate shower and large soaking tub with views of the lake. Wake up and enjoy a cup of coffee on the private master verandah. The second upstairs bedroom also has a queen bed and private attached bathroom. This room also has an attached verandah. A washer/dryer room is provided for use during your stay. Downstairs is the third bedroom and attached bathroom. This room has a queen bed and twin bunk beds. A formal dining room perfect for family dinners. The fully equipped kitchen with breakfast nook will make cooking meals easy. The living room has a smart tv for access to your Netflix or Amazon movies. Step out of the house onto a deck overlooking the gorgeous lake.